Even the process of picking the tapas for me seemed not obvious. Some of the bars display their tapas in the vitrine of the bar stand. Some don't and they will offer you a menu (you can be sure to get it in Catalan, but English is a completely different question). Then you pay (sometimes your bill is calculated based on the number of wooden sticks left on your plate after you ate the tapas off them). While each bar obviously has own selection of tapas, you will notice that some of them are a must and are present almost everywhere. For example these are patatas bravas, esqueixada (salted cod salad), jamón ibérico, manchego cheese, meat or fish croquettes etc. There is another group of tapas, which seems to be needed as a complement to whatever else you've chosen. To me these are gazpacho shots, tomato bread and olives. The Catalans say they have tapas "del mar" (from the sea) and those "de la tierra" (from the earth) - I loved the classification, it is very different from what I would expect (something like meat, fish, dairy, vegetables etc.). Looking for good places I came accross these very helpful Guardian articles - 10 best tapas bars in Barcelona and 10 best bistros in Barcelona. I was interested in trying Quimet i Quimet, famous for its tapas del mar (salmon with truffed honey, canned seafood etc.) and an all time long line outside. However we came in August and Quimet was closed (it was the case with several other places as well, August seems to be a vacation month). At the lesson in cook&taste cooking school when we were talking about Ferran Adria, Alexia (our lovely teacher) mentioned bar Cañete. After that I happily picked it from my long list and we went there for late lunch. Cañete is located in one of La Rambla side streets. It was not at all overcrowded (due to time of the day?) which we were very pleased with. We sat down at the bar stand and were immediately offered the menu. In Catalan. All the people around us seemed to be locals and at first I felt somewhat uneasy. Our waiter however was speaking perfect English and he offered us to pick some drinks. I asked for sangria - "I don't have sangria" he replied smiling. OK, I thought and we went for white wine. The menu wasn't helping me much. 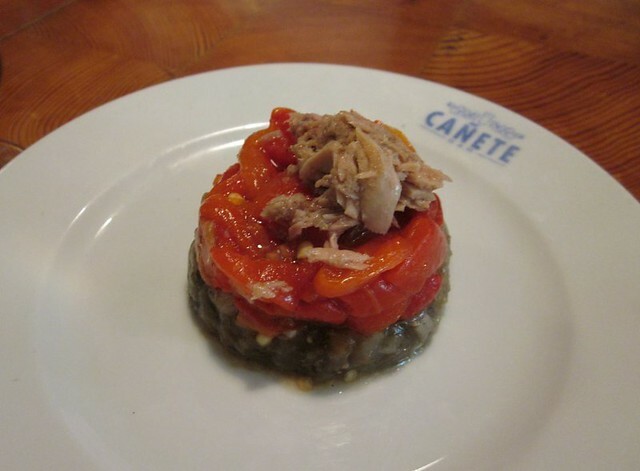 I learned Catalan names of the widely known tapas, but Cañete mostly has their own creative stuff. So I decided to solve the thing through conversation. I asked for tomato bread (Pa de coca de folgueroles / Pa amb tomàquet), escalivada and fried zucchini flowers (Flors de carbassó). The cheese I couldn't pick myself (didn't know the names), so I asked for help and he suggested Casa Mateu. Patatas bravas? - "I don't have patatas bravas", but he offered us another potato dish - Huevos estrellados instead. When I got done with ordering I realized that Cañete actually had open kitchen. We were sitting in front of it and could watch how the food was made. Tomato bread arrived first and I wondered once again how different it tastes depending on the place. The technology of rubbing with tomato and drizzling with olive oil seems the same, but everybody uses different bread. At the plaza Royale we had it made with sliced baguette, at Cook & Taste school - with peasant (sour) bread. Here the bread was ciabatta-like (don't know the Spanish name for it). This warm bread wrapped in foil together with a glass jar of some delicious lemon spread (was a bit like chutney - thick and a bit spicy) arrived without order, I guess as a complement. Escalivada topped with tuna. I love the whole idea of escalivada, which is grilled sweet peppers, eggplants and onions, served chilled, peeled and seeded, seasoned with salt and aromatic olive oil. Delisious. I only tried the fried zucchini flowers in Rome before. These were completely different. 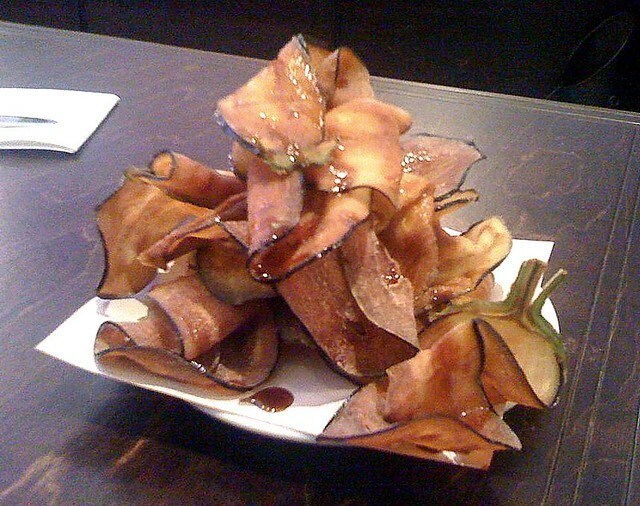 Very large flowers, crispy fried in sweet batter. They were complemented by springs of fresh thyme, fried in the same manner - absolutely irresistible. Soon I noticed some unbelievably looking dish, being served to my neighbor. I asked and it turned out to be Aubergines with honey (Barenjenas Miel). With all my love to sweet and sour variations around cooking aubergines from South-East Asia, I didn't even think before I ordered it myself. Delicious as the whole meal was, these aubergines turned out to be a real feast. They were sliced paper-thin, coated in a bit of flour and fried? to crisp, so they resembled chips. The cook made a magnificent looking construction of them on a plate and spread a thick honey sauce over. Huevos estrellados, which is potatoes (boiled and then fried), mixed with fried egg (the yolk should still be liquid before mixing) was very well cooked as well. That time we chose to have it topped with chorizo, later we also tried the foie gras topped version. We left paying 17 euros per person for the whole feast including wine. We were so happy about Cañete, that we came for the second time during our week-long stay - to try their gazpacho (Vaso Gazpacho), selection of olives, but primarily - to have a second plate of magic Aubergines with honey. Only the amazing looking sweets we never got to try, which makes me think of coming back soon.